The UK has unveiled its first zero emission home that will set the environmental standard for all new homes in the future. The two-bedroom house is insulated to lose 60% less heat than a normal home. 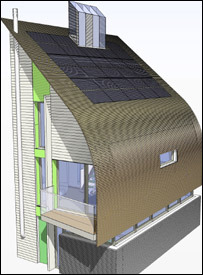 It also features solar panels, a biomass boiler and water efficiency devices such as rainwater harvesting. 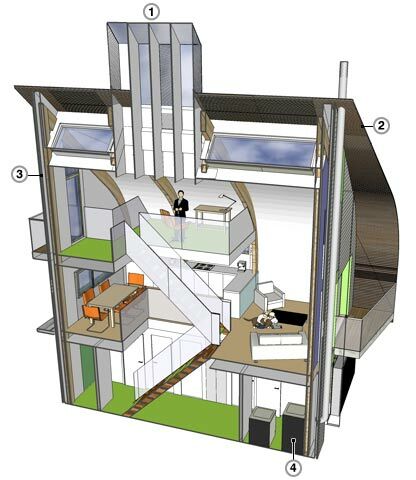 The design, unveiled at the Offsite 2007 exhibition in Watford, meets rules to be applied in 2016 that aim to make UK homes more energy-efficient. The Kingspan Off-Site's Lighthouse design is the first to achieve level six of the Code for Sustainable Homes - which means the house is carbon neutral. About a quarter of UK carbon emissions come from homes. Chancellor Gordon Brown announced in his Budget in March that zero-carbon houses would be exempt from stamp duty. BBC technology correspondent Rory Cellan-Jones said the Kingspan home is the first to reach level six requirements in the UK. "The home generates all its own energy - and when you're away on holiday can send electricity back to the National Grid. The company says its annual energy bill would be £31, as compared to £500 for the standard new home of this size," he said. Among the features in the house are a biomass boiler, which runs on organic fuels such as wood pellets. It counts as zero-emission because the carbon dioxide it gives off during the burning process is offset by the amount absorbed when the fuel crop was grown. It also has a waste separation system that allows combustible waste to be burned to help provide power. There will be smart metering so that inhabitants will be able to tell if they are wasting any energy. While the bills may be cheap, Kingspan, an Ireland-based materials specialist, admits the building cost is 40% more than the standard home. But house designer Alan Shingler, of architects Sheppard Robson, was confident that costs would fall when more of the homes were built. "It gets cheaper when you build, say, 250 of them," he said. "For a whole development you can introduce other ways of generating electricity - which is where most of the extra cost comes."